This year, in conjunction with our allies in the Mashpi Nature Reserve (Reserva Mashpi-Shungo, Pambiliño, Chontaloma, and Yakunina), we are pleased to introduce the Sueño de Vida Field Lab Program for students as a complementary focused fieldwork experience to the university classroom laboratory. In response to the most recent forecasts on climate change, we have carefully tailored our program specifically for students and young professionals who will be faced with new and difficult challenges to existing paradigms, economic systems, and social structures in the very near future. Fast on the heels of the most recent IPCC report to the United Nations on climate change, Global Environmental Facility Chairperson, Naoko Ishii called for “unprecedented transformation” needed if civilization is going to forge ahead as the effects of climate change escalate. Indeed, an impending crisis of this magnitude calls for a trifecta of educational, corporate, and government players sending forth their boldest and brightest to find solutions before the window of time we have left narrows even more. But this monumental effort demands more than ideas, policies, and legislation. It also needs people grounded in direct experience and practical application of alternatives to outdated and environmentally damaging modalities. Providing this crucial experience “on the ground” is where the SdV Field Lab plays a key part. The focused fieldwork experience we offer also gives students a critical edge when it comes to getting on the career path they want in the expanding field of Sustainability. Kristen is passionate about food production and self-sufficiency and loves to share her knowledge. Juan is relaxed and knows a lot about building. If you want to build sustainably, grow food, and get more insights on how to live off the grid, we strongly recommend learning from them. Our mission is to equip students who are learning to think critically in universities with the tools to act constructively in the field, the initiative to create solutions, and the confidence to make solutions happen. immersion in low-impact living within a fragile ecosystem. With crisis on the horizon, we believe that “exposure” to different ways of farming or living, while valuable, is not enough to prepare young people for what is now acknowledged as an inevitably much warmer world as early as 2030. The college students of today will be rising consultants, scientists, and policy makers by 2030. They are the vanguard who will have to wrest opportunity from crisis if humanity is to avoid the impending social and economic upheavals of climate catastrophe. The methods of land regeneration and low-impact living that we (and many other sustainability centers) have initiated and/or adopted could very well be key ways to avert crisis and move toward a healthier world ecosystem. Conserving and planting forests, building soil, crop diversification, and the production of value-added goods (to give some examples), are observably effective ways to capture carbon emissions, increase food production, decrease dependency on long distribution chains, and increase community resiliency. 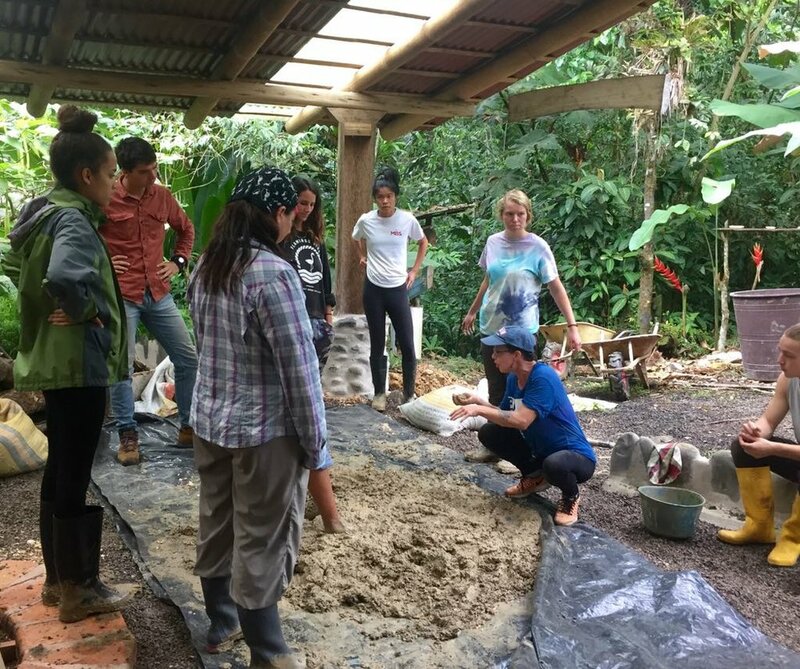 Effective as these practices are, we appreciate the difficulty for students in a new and different place to make the crucial connections between their experience in the micro-sphere of a South American cloud forest and the experience that will continue to inform their future sustainability career paths. Relevance to the current environmental, economic, and social problems that most urgently call for solutions. We frame our presentations in the context of the most recent consensus on climate change and the latest reports on food supply and distribution issues, green building initiatives, consumption problems, and assistance for vulnerable populations. Emphasis on relatability to the students’ areas of study and career paths. 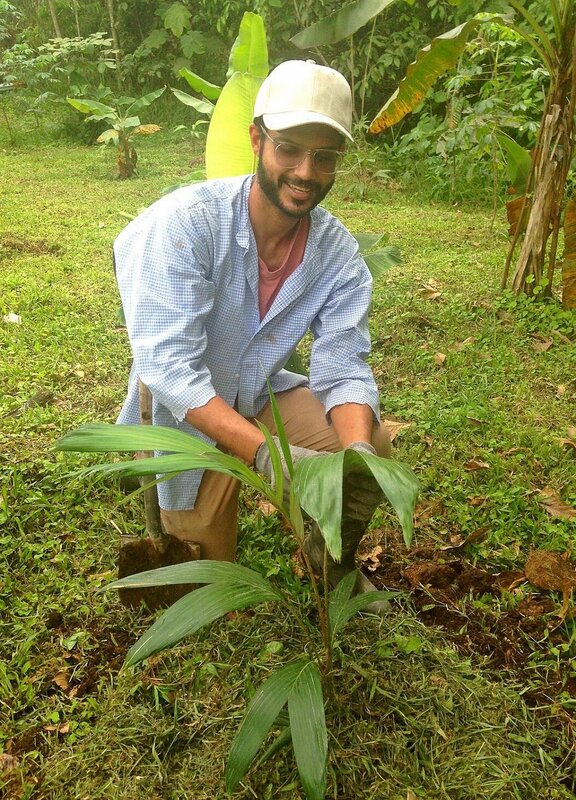 How does an aspiring agriculture specialist relate planting a nitrogen-fixing legume in Ecuador to complex food-production problems in India, or North Dakota? How does building a hut in the forest with vernacular techniques help the future green architect design net-zero office buildings in cities? We engage with students to find the crucial connecting threads. An opportunity to gain knowledge and experience at the SDV Reserve AND four more ecological regeneration projects, all working in cooperation, but each with their own emphasis. This rich itinerary enables students to see and interact with projects who work together to build diversity and community resiliency. Continuation. All students are invited to stay on at SDV after the course as volunteers or to return in the future as apprentices or future course mentors. Access to an online forum we have created especially for the alumni of the SdV Applied Sustainability Studies Program. The forum will serve as a “meet-up” where our alumni can share about their experience with our program and others. As they move into more specialized areas of study, they can post graduate programs and trainings. Upon entry into the job market, the forum can serve as a professional network listing jobs sought, opportunities, and ratings. Each year, as the number of alumni grows, the content will grow, organically creating a valuable resource for young sustainability professionals. Finally there is a growing consensus that the stubbornly entrenched machine of industrialization is not only broken, but steering the world off the deep end of crisis. The question is, what alternatives and solutions are known but not in wide usage? And furthermore, how can these alternatives be implemented in significant ways over the next decade? To address these questions, we have organized the program content the into six main topics outlined below. Dates: Arrival at Sueño de Vida July 11. Departure to Quito Mariscal Sucre Airport July 19. Transport provided directly by the program directors. Program is seven complete days with forty hours devoted to active learning sessions. Location: Sueño de Vida is located approximately 2.5 hours west of the capital city of Quito in the quiet, safe, primarily rural canton of Pedro Vicente Maldonado, known for its cloud forest, rivers, wildlife, and ecologically focused tourism. Cost: Cost of the program is $1200 and includes transport to and from Quito Mariscal Sucre Airport, comfortable indoor lodging, nutritious and tasty food (much of it grown and harvested on-site at Sueño de Vida), a day in the Mashpi Nature Reserve, and a program workbook with complete course content, workspace, and relevant articles. Two $300 scholarships based on need and an entry essay are available. Founded in 2016 on just eight acres of degraded pasture, Sueño de Vida is a forward-leading and rapidly growing project pioneering ecological regeneration in an area of Ecuador’s cloud forest most devasted by logging and industrial agriculture. Now with thirty acres of land under their management, including a cacao plantation recently converted to organic cultivation, creators Juan Santillan and Kristen Krash work steadily to transform a “green desert” into a rich soil-building and habitat-providing polyculture. They have already planted over one thousand trees and plants of over a hundred different native and naturalized exotic varieties. At the bamboo and superadobe facility they built themselves, they host a lively work exchange program for aspiring permaculturists and green builders, teach sustainability courses, and facilitate nature retreats promoting responsible eco-tourism. Prior to pioneering a large-scale natural restoration, Kristen studied history and economics at American University, became a senior certified yoga teacher with fifteen years of experience, led clean-ups of local parks and rivers, and taught gardening workshops to children and adults in community centers around Washington, DC. She was known for her lead-by-example style of activism and especially for her “guerilla gardens,” burgeoning green spaces she created in derelict lots. Now she “guerilla gardens” on another level by reforesting hectares of degraded land. Juan also lived in the D.C. area, honing his building skills while quietly formulating the idea to return to his native country to “make a real difference” in the world. Once back in Ecuador, he found his niche constructing ingenious, sustainable, earthquake-resistant structures with local bamboo that utilize natural land features like slope and contour to bring water in and take waste out with minimal environmental impact. His low-key, managerial style is the perfect foil to Kristen’s passionate delivery on topics of agro-ecology, food production, local economies, and community resiliency. 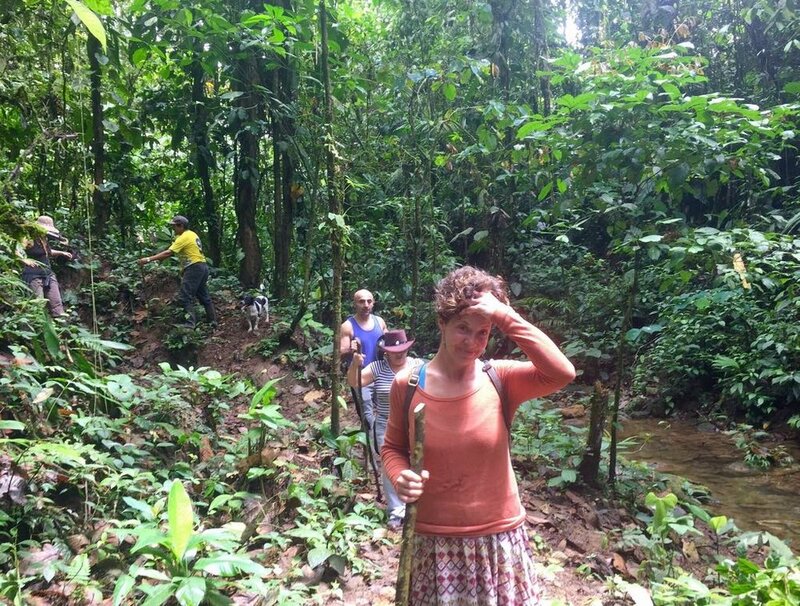 Kristen also contributes articles regularly to permaculture/sustainability websites and is currently writing a book on foods of the cloud forest. For more details relevant to this program, visit the Sueño de Vida homepage and pages on Accomodations, and What to Bring. If you choose to continue your stay at Sueño de Vida after the program conclusion, also visit Work Exchange. Nine years ago, wildlife biology students Alejandro Solano and his wife Agustina Arcos met while doing fieldwork in Costa Rica. The pair decided to return to Agustina’s native northwest Ecuador to do something daring: use analog forestry methods to cultivate a prized heirloom variety of cacao, Aroma Nacional, in the midst of an agro-industrialized belt of monocultures and cow pastures. Under the auspices of the IMAMAYA Foundation, they were granted a parcel of land under strict conditions that the majority be managed as a natural reserve, with just eight hectares designated for cultivation. Skeptics and high-yield agronomy experts advised them against planting the heirloom cacao. Too much work, not disease resistant, not enough yield, the skeptics said. They were wrong. After just four years of diligently applying agro-ecology methods--planting a diverse shade canopy, nitrogen-fixing plants, and green fertilizers--the circular system took hold and Mashpi-Shungo began producing Aroma Nacional Cacao. A lot of cacao, with many of their heirloom plants outpacing production rates of the allegedly more vigorous clones. Soon there was enough cacao to launch the production of their own value-added product: award-winning organic dark chocolate bars. With a small team of dedicated local workers, the couple has successfully internalized the entire “bean to bar” process, even the packaging made of sugar cane fibers, to their farm. Alejandro now regularly teaches agronomy students from around the world their successful techniques while Agustina works tirelessly in the chocolate factory, creating new flavors and products with the native fruits of the cloud forest cultivated alongside their robustly productive heirloom cacao. At the same time the Mashpi-Shungo duo started setting up camp, Pambiliño Reserva founders María Elena Arcos (Mari) and her husband Oliver Torres gained stewardship of an area of land designated as a conservation “hot spot” in the northwest cloud forest. While their neighbors Alejandro and Agostina specialized in heirloom cacao, Mari and Oliver took a more broad-based approach, planting a wide spectrum of timber, fruit, nut, and medicinal trees similar to the way indigenous people had intelligently farmed the forest before logging and the Green Revolution. They also are developing an added-value production with valuable cardamom spice thriving under the now mature shade canopy sown just a decade ago. Previous to creating Pambiliño, Mari studied environmental journalism while Oliver pursued a Masters in Environmental Studies. Oliver now works steadfastly to address water contamination issues and preserve the remarkable endemic biodiversity of the reserve and larger cloud forest biosphere. Mari, a natural and strong communicator, teaches a program for local children in the Pambiliño “Bosque Escuela” (School in the Forest). The couple regularly hosts volunteers, university students, and development professionals seeking alternative methods and solutions to environmental problems. Another younger regeneration project akin to Sueño to Vida, Reserva Chontaloma was created three years ago by Italian biologist Arturo Falchi and his wife, psychologist Paola Valencia Castillo. In those three short years, the couple has transformed acres of cow pasture and poorly managed land into a verdant polyculture of native fruits and exotic imports like vanilla and black pepper. Paola is a strong voice for women in the Mashpi pueblo, spearheading the growth of the simple Mashpi acampamiento (campsite) into a site for community meetings, promotion of eco-tourism, and the sale of artesanal goods made locally with the fruits of the forest. Arturo works daily to preserve and increase the biodiversity of their land and co-created the new “Pie Montano” trail linking the four neighboring projects and highlighting areas of unique endemic species, water conservation zones, analog forestry cultivation, and natural regeneration. Arturo and Paola also host a lively work exchange program and permaculture design courses. The last stop on the Pie Montano trail, Reserva Yakunina is an innovative regeneration project founded by bioconstruction jack-of-all-trades Miguel Torske and his wife Paulina Lasso, a superlative organic gardener and permaculture design teacher. The couple purchased a plot already planted with chemically-treated heart-of-palm trees, one of Ecuador’s largest monocultures. Following the mantra, “Don't villainize the tree, change the method,” they committed to converting the plantation to an organically cultivated polyculture, integrating the heart-of-palm into the process. They now produce their own high quality added-value good: certified organic heart-of-palm artistically packaged in re-usable glass jars. Miguel is also an avid builder and excels at combining high-efficiency know-how with natural construction materials in practical ways like rocket stoves and water filtration systems. Recently, Reservas Yakunina and Chontaloma worked together with assistance from the Mindo Cloud Forest Foundation to plant 1,000 new timber trees on their bordering hectares of regenerating land. Afternoon FieldLab: Divide into two teams and debate the statement: “ You can't feed the world with agro-ecology.” What are the arguments/justification for this statement? What are the arguements against? What do future food and agriculture scientists need to do to show that agro-ecology systems are not only more ecologically sustainable than chemically dependent monicultures, but as or even more productive? Morning FieldLab: Re-visit the 3-year planned regeneration plot for closer observation. While in the field, learn the basics of bio-mimicry, or designing a crop system based on analogs from a natural ecosystem. Identify the layers of an agro-ecology system and understand the functions of each layer respective to the whole. Presentation/Exercise: Learn how to design a productive self-sustaining agro-ecology system with an understanding of timing (pioneer/supporting, target, and mature phases), multi-functionality, and long-term growth. Afternoon FieldLab: Putting knowledge into action. Return to a one-year natural regeneration and begin to prepare the land for pioneer edible species (cassava and banana). While clearing, learn how to use cut vegetation to create “biomass webs” to fertilize soil and retain ground moisture. Breakfast/Kitchen clean-up. Transport to Mashpi Nature Reserve 30 min away. 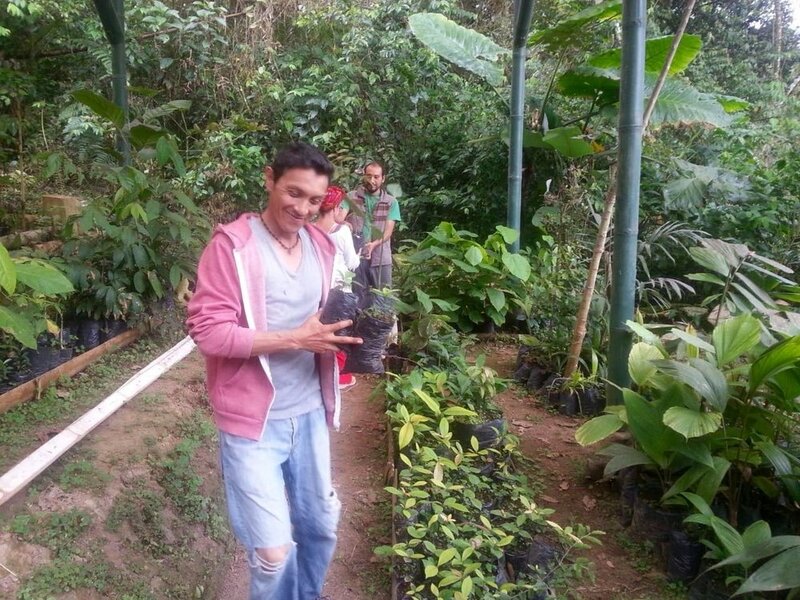 Guided Tour of the Mashpi Artesanal Chocolate Farm with co-founder Alejandro Solano. Experience a mature agro-ecology system and “farm of the future” where a small, dedicated team has successfully regenerated a degraded pasture to a highly productive and diverse heirloom cacao farm. Follow the entire “bean to bar” process from organic cultivation to award-winning fair-trade chocolate all contained within a small area on conserved forest land. Gain insight into how farmers can add value to their products even with minimal infrastructure. Guided tour of the “Pie Montaño” trail with biologist Arturo Falchi of the Chontaloma Reserve (Part 1, Mashpi-Shungo to Pambiliño). Walk through a mature natural regeneration (secondary forest) resulting from commons conservation. Observe soil quality, ambient temperature, humidity, ground moisture, plant diversity, and wildlife present. Discover a diverse array of useful plants that provide medicine, mulch, building material, and wildlife habitat. Lunch at Pambiliño Reserve. Try a meal of diverse foods native to the cloud forest harvested directly from the reserve farm, also a mature agro-ecology system. Guided tour of Pambiliño Bosque Escuela, nursery, and composting station with co-founders Mari and Oliver. Presentation by Mari on the importance of local diversity vs long-chain distribution and the preservation of local knowledge of forest cultivation methods. Break for swimming in the Mashpi river and lagoon! Guided tour of the ¨Pie Montano¨trail by biologist Arturo Falchi (Part 2 Pambiliño to Chontaloma. Chontaloma to Yakunina). Learn about water testing and conservation, ways the Mashpi community is working to conserve their commons, more about the unique wildlife species endemic to the cloud forest, and the three year regeneration projects at Chontaloma and Yakunina Reserves. Presentation at Yakunina Reserve by founders Miguel and Paulina. Learn how they converted an agro-industral heart-of-palm plantation (one of Ecuador´s biggest monocultures) to organic agro-forestry management and created their own added-value product. Also, Miguel will guide stdents through the various bioconstruction projects at Yakunina and explain sustainable water-purification, waste-treatment, and power-producing systems. Return transport to SDV Reserve. Light Evening meal/Dialogue about the day. Presentation: Compare and contrast building as a source of pollution (carbon, waste, trash) vs. building as a source of production (energy, food, recycling). Compare and contrast conventional high-impact building inputs (cement, virgin wood, etc) with lower-impact alternatives in the rapidly growing field of green building (sustainable “cement”, hydraulic lime, hempcrete, etc). Morning FieldLab: Mix natural materials for our onsite building project: an efficient cool-storage closet for keeping produce. Learn the basic chemistry of the most common and accessible natural construction materials: binder, aggregate, and re-enforcement (clay, sand, and plant fiber) and how it compares to cement. Gain understanding of basic vocabulary like insulation vs. thermal mass and how materials influence temperature stability and power demands of buildings. Learn how to mix natural materials by hand for smaller projects (or larger when labor is readily available) and mechanized options. Afternoon FieldLab: Project build. We’ll spend a few hours getting our cool-storage food pantry off the ground. While building, learn the basics of sighting a build for specific purposes (shade, sun, slope, berming, etc), foundations, and framing (when necessary). Gain understanding of how these basics can apply to larger green building projects. Presentation: Building by hand is empowering, fun, and an often practical way for a community to demonstrate self-sufficiency. But how does it fit on with the crowded modern world of cities and suburbs? We´ll examine the natural and sustainable building methods currently gaining ground in on and off-grid locations. Discuss how building practices and codes need to evolve to meet net-zero goals. We´ll also look at several promising green building trends (e.g. rooftop/vertical gardens) that can also help address food distribution problems and how they can be integrated more purposefully in urban building plans. Afternoon FieldLab: We´ll finish our build-out and take a tour of the Sueño de Vida facilty with co-founder and builder Juan Santillan to get his experienced perspective on building with local materials and working with local people mostly unfamiliar with alternative methods. Presentation: Historical overview of food distribution patterns from the post-war period (1950) to the present day. Examine shifts from diversified small-holdings (farms, orchards, and gardens) to large monoculture cereal production and increased dependency on standardized crops. rice, corn, soy, and wheat. Discuss the advantages and disadvantages of the shift from more localized food diversity to long-chain distribution of standardized crops. Discuss possible outcomes of severe staple crop reductions due to climate change and how localized diverse food production can be a viable solution. Morning FieldLab: Walk through the regenerating areas and learn the many purposes of many of the species from the perspective of the 5 F´s: food, fodder, fertilizer, fuel, and fiber. Harvest a diverse array of foods from the Sueño de Vida farm (protein, complex carbohydrates, fruit, vegetables, and herbs). List and discuss high-calorie crops that can serve as nutritious alternatives to rice, corn, soy, and wheat. Prepare the harvest for lunch and the Afternoon FieldLab on food processing and preserving. Afternoon FieldLab: Learn the once-commonly practiced art of “putting up “ fresh fruits and vegetables--preservation by salting, pickling, and canning. While processing the morning harvest, we’ll discuss the problem of food waste, the economic and social costs of long-chain distribution, and the possibilities for local diversification within the contexts of urban food production and green building. Presentation: Examine how the pattern of exporting natural capital to industrialized countries creates and enforces a cycle of poverty in exporting countries. Discuss the advantages farmers, the local community, and the country gain by adding value to natural capital via processing at or near the site of production. Discuss the obstacles to adding value on-site and possible solutions. Morning FieldLab: Get hands-on experience adding value to a crop commonly exported from Ecuador as a raw material: cacao. Most cacao farmers in take their harvest straight to the distributor in “wet” 50kg sacks, and are therefore totally subject to market price fluctuations. At Sueño de Vida, we've moved toward resiliency by constructing a low-cost manual infrastructure to ferment and dry our cacao on-site, Assist in the harvest, fermentation, and drying process of the beans. Afternoon FieldLab: Kristen and Juan are also in the experimental stage of creating a unique extra value product: superfood cacao energy bars. Learn the necessary steps of turning an idea into a sale able product. Do a taste-test of a sample product, brainstorm about packaging, points of sale, and target market. Observe how other people, the local community, and Ecuador benefit from raw materials transformed into extra value products. Final Discussion: Recap of the week and group discussion of how all the possible transformations we addressed could build a new paradigm, based not on short-term finite gains, but on long-term future growth of a more sustainable, just, and opportunity-rich world for all. Goodbyes and departure! Students wishing to continue as volunteers and apprentices are welcome to stay. All students will receive a SdV FieldLab Workbook with a complete outline of course content, pages for notes and exercises, and news journal articles relevant to topics covered in the program. Monoculture crops degrade and destroy ecosystems, displace wildlife, endanger food supplies, and are much more dependent on intensive use of chemical herbicides, fungicides, and fertilizers. Dependence on chemical fertilizers weakens plant root systems, making them less resilient to disease, drought and heavy rains. The cycle is then precarious: a single crop dependent on chemical interventions. If the chemicals are not available or a resistant disease invades, the entire crop can be destroyed, adversely affecting the food supply and income to the farmer. Polyculture crops and supporting plants build and enrich ecosystems, provide habitat for wildlife, secure food supplies, and create a healthy circular flow requiring fewer inputs and less intervention over time. Has a long and established history of providing food while preserving ecosystems, especially those with fragile soils. Mimics a healthy self-sustaining ecosystem, such as a forest, where a broad diversity of plants perform different functions to make a whole greater than the sum of its parts. To iterate only a few examples: Tall deep-rooted trees mine minerals from soil, fertilize with leaf-fall, provide perches for predator birds that keep so-called “pest” populations in check, and shade and protect other species. Mid-sized trees provide more leaf fall and host their own set of wildlife. Low plants and groundcovers hold delicate topsoils, retain moisture in the ground during drought, and siphon excess water during wet seasons. In the soil, insects and microbes digest leaf litter, adding organic matter to soil. Soil rich in organic matter is a huge carbon sink. Forests and regenerated land are key to mitigating global warming. As the system matures, fewer inputs and less intervention/labor is needed. Diversity in crops provides more food and income security and continued propagation of more varied species. Initially requires more time and labor to set a system of agro-ecology in motion. With an emphasis on perennial crops, it will also take more time to realize the first yields. Annual crops can fill the gap if one understands the analog system. Knowledge of the analog system is not prevalent. Universities, responsible corporations, governments, and private foundations must work together to educate food producers and quantify results. Entrenched agro-industrial companies will not want to relinquish market share and will actively fight competition with recourses to legal suits and political lobbies. “You can't feed the world with food forests,” the argument goes. Perhaps that arguememt would be better phrased as “You can't feed the world as we know it….” Feeding the world is less a problem of food production than an uneven and complex distribution system. We also will explore the distribution problem in this program. Guide students through tours of several categories of land: a degraded pasture, an herbicide intensive monoculture farm, naturally regenerating land, a one year planned regeneration (SdV), 3 year planned regenerations (SdV, Chontaloma, Yakunina), mature 10 year planned regenerations (Mashpi-Shungo, Pambiliño), and a protected cloud forest (Mashpi Reserve). Students will be able to observe and compare soil quality, ambient temperature, humidity, and diversity of plants and wildlife within each category. Observe and compare a mature regeneration project to a conserved area of forest. How are they similar? Identify the “layers” from canopy to ground and describe the functions of each layer. Identify pioneer species, target species, and supporting plants. Get hands-on experience the regenerating land in the early stages by planting pioneer species and understanding their vital functions. The building sector currently contributes an estimated 30-40% of carbon emissions. Cement, the second-largest contributor to greenhouse gases, is used in huge amounts and often unnecessary ways, especially in developing countries. The vast majority of commercial and residential structures are “boxes”; Everything vital to the occupants (food, water, power, heat, cooling) must be brought in, and all waste must be taken out. Within the small number of buildings that produce something, food in a rooftop garden, for example, they lack the integrated infrastructure to make full use of it. Uses natural, inexpensive materials such as strawbales, plant fibers, and rammed earth to build insulating structures and superabobe/earthbags to withstand earthquakes and floods. Innovates design to take advantage of natural landscape features such as slope, sunlight, shade, etc. to provide water, light, stable temperature, etc. Building codes must be updated and made more flexible to allow for innovation. Lack of knowledge. Natural alternatives like strawbale and superabobe must be mainstreamed, especially in the developing world where cement is fast and cheap. Convention. Methods and designs termed “innovative” or “revolutionary” must become the norm. With green building, the techniques and know-how to make a real difference in carbon emissions is there. How do we make green building all building? Like agro-ecology systems, green buildings take more investment to build, but cost less to maintain over time. How do we overcome the initial investment hurdle for poorer populations? Tour the SdV grounds and observe how natural features like slope, contour, shade, and location relative to a water supply influenced the plan and layout of the facility. Tour the SdV, Pambiliño, and Yakunina facilities and listen to explanations of the different materials and Bioconstruction methods used to build: native bamboo, superabobe, clay & fiber, earth plasters and mortars, hydraulic lime, and repurposed materials. Learn the techniques and build an earthquake resistant superabobe wall and an insulated cool-storage closet with clay and natural fibers. The SdV FieldLab program is the property of Sueño de Vida co-founders Juan Santillan and Kristen Krash. Please share the website link, but do not copy any content without the consent of the founders. Thank you.